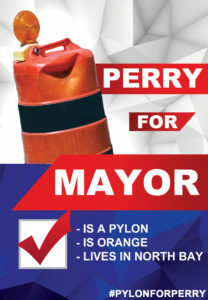 Perry, a dented traffic pylon which has sat on the Overpass for the last three weeks, will be running for Mayor. Perry, who was manufactured in Pickering, Ontario in June of 2016, has stood strong and proud in North Bay for the last six weeks: first on Oak St., and now on the Overpass. Somewhere along the way someone or something ran into Perry, giving him the charming dent which separates him from the hundred of other black and orange safety markers. But aside from being a bright orange pylon, Perry is also a scholar. Reports indicate that he spent several days inside Nipissing University, where he no doubt sat in on many a political science class. One anonymous source told us that Perry has already read every North Bay bylaw, and has been over the current 400+ page budget numerous times. Perry has no fixed address, but The North Bay Bay learned that he always stays inside the city. What’s more, if Perry wasn’t an inanimate object made of coloured thermoplastic and rubber, he’d most certainly be paying North Bay taxes, and wouldn’t move to Callander. Those looking for more information about Perry are asked to stop by the Overpass in North Bay and talk the local construction workers. All of them have agreed to answer questions about Perry’s upcoming political campaign and are happy to give out free “Pylon for Perry” buttons.